Hi guys! It's Rita here. About two weeks ago, we were gifted a new product from The Body Shop. In case you're new to our blog, The Body Shop challenged us earlier this year to create original vegan recipes inspired by their latest launches. So far, we've worked on a Coffee & Pear Coffee Cake inspired by a firming green coffee cream, a Vegan Cashew Mango "Yogurt" inspired by their multiscented body yogurts and an Anti-Inflammatory Ginger & Turmeric Syrup inspired by their Roots of Strength firming shaping serum. 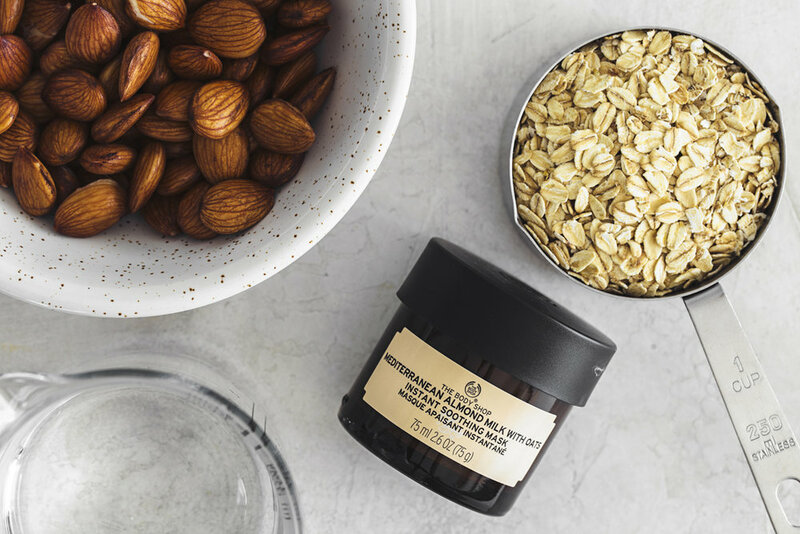 This time around, we received the Mediterranean Almond Milk and Oats Instante Soothing Face Mask. It's particularly beneficial to those who bare sensitive, irritable skin (ehm, myself! ), as it also includes other natural and soothing ingredients such as aloe vera and shea butter. As soon as we opened it and had a glimpse of its texture and flavour, we realised – this is the perfect chance to finally share the simplest recipes there is, Almond Milk and Oat Milk! There's really nothing to it, and by making our own plant-based milks, we tick a few important boxes: we avoid consuming additional plastic packages, we save the money we'd be spending on overpriced storebought milks and we keep their composition as simple and healthy as possible. And we can even use the leftover pulps in other recipes, which makes this task truly waste-free. Today we're sharing two examples of plant-based milks. The people's favourite almond milk, which requires previous soaking (you can soak the almonds in boiling water and allow it to cool down completely – they'll be ready to blend in two hours); and the not-so-common-and-yet-delicious oat milk, which you can prepare straight away and at any time, no soaking needed. To prepare plant-based milks, you actually only need two ingredients: the main ingredients, whichever it may be, and water, preferably filtered. But we like to spice things up and add a few optional ingredients. Usually, we add 1 medjoul date and a pinch of himalayan salt for every liter of water. These will be enough to add a subtle flavour to your milk. Wanna make things even more interesting? Consider adding either of the following: cinnamon, cardamom, turmeric, vanilla (extract or bean), raw cacao powder. Give it a go, make a few experiments and see what are your favourite combinations! To make either of the milks, combine all the ingredients in a high speed blender and blend. Blend the almond milk for 1 to 2 minutes and the oat milk for 30 to 40 seconds, as it can get slimy if blended for longer. 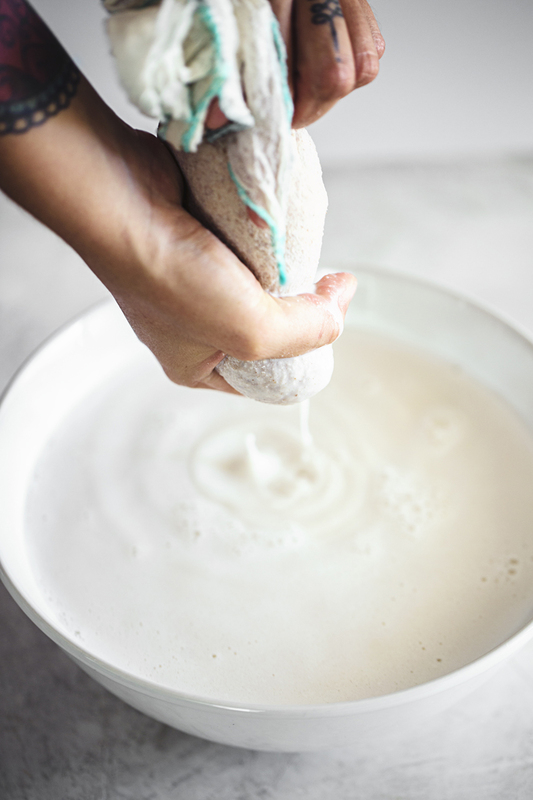 Place a clean cheesecloth or almond milk bag over a large jug or mixing bowl and carefully pour in the milk. Carefully close the cheesecloth of bag, making sure there are no loose ends, and twist it slightly to make sure it's tightly closed at the top. Squeeze the cheesecloth or bag to drain all the milk from the pulp. Discard the leftover pulp or save it for recipes such as cookies, cakes, crackers, breads and porridges. Store the milk in an airtight jar or glass bottle in the fridge for up to 3 days. Remember to always shake it before serving.